The sight of the Great Sugar Loaf wearing a faint snowy hat and the desire to escape the ennui of the office convinced us to take to the hills! Discovering that the Army wasn’t using the artillery range, we resolved to make climbing the main gully on Lugnaquillia’s North Prison our objective for the day. We parked at the first gateway to the artillery range up the rough track past Fenton’s Pub and began the long pull up Camarahill savouring the crunch and squeak of fresh snow beneath our boots. We descended the steep side of Camarahill towards the Bluffs rising steadily to gain the corrie beneath Lugnaquillia’s North Prison. Once off Camarahill the sun was surprisingly hot but the weather was fickle; kaleidoscopic clouds raced across a Prussian blue sky, occasionally grey and angry enough to generate flurries of snow. Huge granite boulders encrusted with ice lay amid drifts of snow feet thick on the outstretched arm of terminal moraine that seemed to gently coax us upwards and inwards to the corrie. Obstacles such as secret streams obscured beneath a blanket of glittering snow betrayed only by their musical tinkling, and patches of bog unseen until trodden on, slowed our pace considerably. We located the main gully (T028920 D) at the back of the corrie, a white streak shooting some 200 metres upwards towards the summit. It didn’t look all that steep before we began to climb it, but appearances are deceptive. 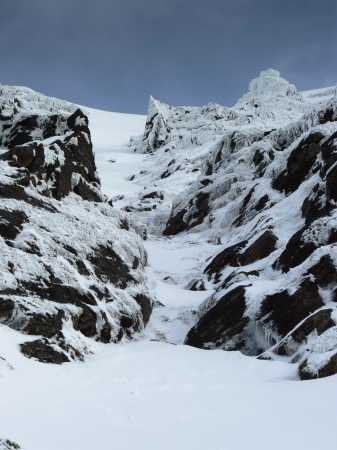 This is described as a Scot Grade I climb in the Wicklow climbing guide, but in places the slope surpasses 45 degrees and the fact that a fresh covering of snow lay atop granular, in places very unstable old snow and compacted ice, made progress difficult. Mcrtchly had to cut steps for almost the entire route and I would estimate the route in this condition was verging on a Scot Grade II endeavour. The crux of the route lay only 10 metres or so from the bottom where sheets of ice had consolidated over boulders making the use of the pick end of an ice axe essential to maintain upwards progress. The view up the gully was superb. On the right, about half way up is a very distinctive pyramidal pinnacle of rock that was picked out sharply against a deep blue sky, making the surroundings appear and feel positively Alpine. Every so often chunks of ice and snow fell from the surrounding walls with a dull thud followed by a strident hiss as thousands of small chunks sped off down the gully.